“CHARITHA CHITRA” is one of the South India’s hoary entertainment Company. Its business includes Film Production, TV Content Production. CHARITHA CHITRA Group plans to become a giant in the entire entertainment industry’s sphere and also will become one of the largest content agglomerates television in India region. Our Company was incorporated in July 1979 as “Charitha Chitra. The company was engaged in production of Telugu feature films and releasing them on various modes including theatres. Our Company has been owned by Mr. TAMMAREDDY BHARADWAJ. Mr.TAMMAREDDY BHARADWAJ produced number of films and he has 42 years of experience and domain expertise in entertainment sector. He is a veteran in the film industry and produced so far 29 films in various capacities such as Director/ Executive Producer/ Producer. In a short span Charitha Chitra has established itself as a major producer in Telugu language and scheduling to expand across south India. Charitha Chitra has entered into TV Reality Shows in the month of December 2008 and plans to become a major TV content supplier in the current fiscal year itself by producing over 5 hours of original programming per day, by that time, it will become a aspiring producer of TV content in India. CHARITHA CHITRA” a holistic Indian entertainment company. Its diversified businesses include Film and Television Content Production. This has propelled it to take the entertainment industry to the next level. The Company has in the last few years ramped up aggressively and has transformed into a corporate through its focus on strategic acquisitions and its robust business model. Currently, it has a strong presence in all streams of entertainment business in south India. CHARITHA CHITRA is the content production arm with a full-fledged, state-of-art production facility. Content production comprises two divisions- Film and TV Content Production. This division is currently producing more than two hours of TV content production per week. There is a variety of programmes in the pipeline for TV channels. Our show, ‘MAA MOGUDS PELLAMS’ is currently on air and very recently ‘ANDHAMAINA BHAAMALU’ a reality show in ETV. ‘Sa Re Ga Ma Pa’ a musical reality show on air in Zee Telugu, “SWARANEERAJANAM”, “MOGUD’S PELLAM’S” has created rave reviews. Our upcoming project “ALAJADI” in ETV too can create history for our company. “SWARANEERAJANAM” and “SA RE GA MA PA” are the biggest and most popular reality singing shows on Zee Telugu, “ANDAMAINA BHAAMALU” is the immense and the majority well-liked reality talent hunt show on ETV has achieved a mile stone victory and created history in the audience. This shows which came on air a few months back with Experienced & fresh singers, beautiful girls within the age group of 7-24 years, received a tremendous welcome from the Telugu audiences. The shows kept up to the audience expectations with its magnificent sets, creative singing, talent pick up rounds and of course accurate portrayal of the Reality element. The Producers of ”SWARANEERAJANAM”, “SA RE GA MA PA”, “ANDHAMINA BHAAMALU”, “MOGUD’S PELLAM’S”- Telugu are happy because it has kept up to its aim of discovering good singers, Miss Andhra, beautiful couples in Andhra Pradesh. The fact that these youngsters of “SA RE GA MA PA”, “SWARANEERAJANAM”, “ANDHAMAINA BHAAMALU” have won opportunities to sing, act in films, it justifies the hard work and high quality that has gone into the making of this show. “MOGUD’S PELLAM’S” which is on air every Sunday from 9.00PM to 10.00PM on MAA Television, has also witnessed tremendous escalation in its TRP. With renowned anchors “NANDA KISHORE” and “RESHMI” vows to crown in 2010. Our upcoming project “ALAJADI” in ETV too can create history for our company. 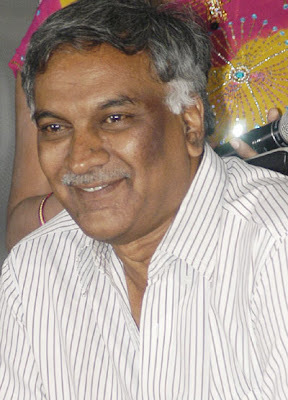 Bharadwaj introduced several new faces to the Telugu film Industry. He introduced many Actors including the Male Lead, Female Lead, Supporting Roles, Music Directors and Directors. Malasri’s first film as heroine is ‘Manmadha Samrajyam’. She went on to become number one in Kannada Industry. Ranjitha- (Kadapa Reddamma), Priyanka- (Suri) and Gayatri-(MoguduKavali) were introduced as heroines. Editor Shankar introduced as Director in ‘SURI’(2001).